Description: It is a small thorny tree with narrow elliptic leaves which are shed during winters. The tree bears large, scarlet red tubular flowers and round fruits with woody rind. 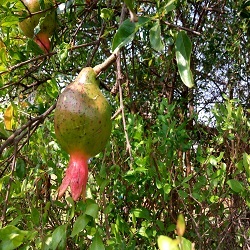 The fruit contains numerous seeds wrapped in rose-coloured, juicy, edible aril. How to Grow: Daalimbe is a widely cultivated plant and its fruits are readily available in the market. However, since its flowers are also used for primary health care, it is worthwhile to allocate space for this plant in the backyard. At least one plant, grown in the ground, is needed for the home herbal garden. A fully-grown tree may require about 4 sq. m space. It also makes a good and attractive pot plant but from medicinal use point of view, it may not serve the purpose. Care regime: The plant needs only occasional watering. Parts Used: Flower buds, fruit and fruit-rind. Collection: Flower buds can be plucked with hand when required. Similarly, fruits can be plucked when ripe. Fruit rind of the used fruits should be dried in shade and kept in stock for use.